Iran Talks: Is New Momentum Enough? Diplomats from Iran and the world’s six major powers met in Almaty, Kazakhstan on February 26. What did the talks produce? The talks between Iran and the world’s six major powers — the United States, Britain, China, France, Germany and Russia, also known as P5+1 — produced an agreement to meet twice again soon. Iran agreed to technical talks on March 18 — before the major Nowruz holiday starts on March 19 — and to a full diplomatic session on April 5, just after the end of the extended holiday on April 2. The outcome does signify new momentum on process, if not substance. The first three rounds, beginning in Istanbul in April 2012 — were largely unproductive. And Iran had set the bar so low for the Almaty talks that even its modest reaction is interpreted as a positive sign. In fact, however, Western negotiators pointed out that Iran did not formally respond to the specific offer by the P5+1. Iran simply pocketed the proposal without commenting on it. Did the deal offered Iran differ from the June 2012 proposal made in Moscow? How? Compared with previous offers, the expanded proposal evidently requires less of Iran — and offers Iran more. First, the major powers asked Iran to temporarily suspend uranium enrichment at the underground Fordo facility outside Qom. They had earlier demanded that Iran shut down the controversial facility. Second, Iran would then be allowed to keep some uranium enriched to 20 percent, if it has not been converted into a form that could be used for reactor fuel. The P5+1 had earlier demanded that Iran ship all such enriched uranium out of the country. In return, the world’s major powers offered to ease some restrictions on Iranian financial transactions. The full proposal has not yet been released — and the devil will be in the details. The precise wording of the changes could have particularly important implications for easing Iranian financial transactions. The bottom line of the fourth talks is that the P5+1 compromised principles it originally outlined as absolute requirements for a deal. The deal also sets aside — or at least modifies —concerns by some P5+1 governments that early relaxation of sanctions could reduce pressure on Iran to agree to a final deal. What was Iran’s initial response to the proposals? What does it indicate about prospects for a diplomatic resolution? 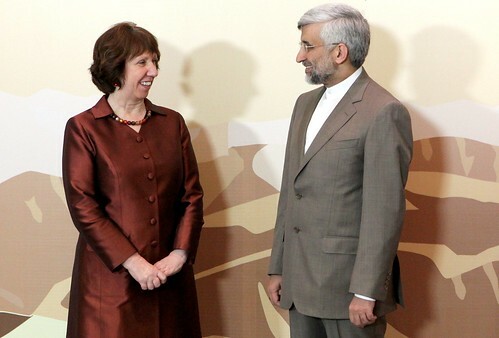 Iran’s chief negotiator Saeed Jalili was unusually positive about the P5+1 proposals, describing them as "more realistic," "closer to the Iranian position," and "a turning point." Before the meeting, Iranian officials had insisted that the meeting was primarily for the P5+1 to make a substantially different offer to Iran, which created minimal expectations for the talks — and even laid the basis for rejecting a new proposal. The optimistic view is that the long months and years of Iranian stalling may be over — and that Iran is willing to have serious negotiations about reaching a deal. The P5+1 have also shown flexibility, which may give Iran hope that the international community will bend further to get a deal with Tehran. Now, the hard bargaining begins in frequent sessions on specifics. The pessimistic view is that Iran now has serious incentives to stall even longer, since the P5+1 have begun to bend. Iran’s has recently accelerated installation of new centrifuges, which will enhance Iran’s enrichment capability — at a time its stockpiles of enriched uranium are already troubling. As a result, the time Tehran needs to “break out” to produce highly enriched uranium is diminishing. Iran may have good reason to believe that time is on its side. The Islamic Republic may even be willing to agree to frequent talks to forestall more vigorous international action. Iran’s actions in the coming days will be interesting to monitor. In the past, leading politicians — most notably Supreme Leader Ali Khamenei — have taken hard-line positions that have severely limited the ability of Iranian negotiators to compromise. Patrick Clawson is Director for Research at The Washington Institute for Near East Policy.